If you’re not already cooking with olive oil, even more compelling evidence has emerged that you should be. A recent study from Spain has found that olive oil could help lower blood pressure and stave off hypertension. Hypertension, as is widely known, is a primary component in the development of heart disease. And, heart disease is the No. 1 killer in the U.S. and Canada. While many people take prescription drugs to help control their blood pressure, olive oil is one of the many healing foods that could help fight hypertension naturally. In the Spanish study, researchers noted that olive oil polyphenols have been associated with several cardiovascular health benefits. This prompted them to examine the influence of a polyphenol-rich olive oil on blood pressure and endothelial function—the elasticity of the blood vessels. The research team recruited 24 otherwise healthy young women with high-to-normal blood pressure, or what they called “stage 1 essential hypertension.” After a run-in period of four months, two diets were assigned to the participants: one with polyphenol-rich (about 30 milligrams per day) olive oil; the other with polyphenol-free olive oil. Each dietary period lasted two months with a four-week washout between diets. The researchers measured systolic and diastolic blood pressure, serum or plasma biomarkers of endothelial function, oxidative stress, and inflammation. They also evaluated ischemia-induced hyperemia in the forearm—a condition in which blood pools under the skin. The researchers found that, when compared to baseline values, the polyphenol-rich olive oil diet led to a significant decrease (of 7.91 mm Hg) in systolic and (6.65 mm Hg) diastolic blood pressure. A similar finding was found for serum asymmetric dimethylarginine, or ADMA. ADMA is a naturally occurring chemical in blood plasma that interferes with nitric oxide production. Nitric oxide is needed to keep your endothelium healthy. 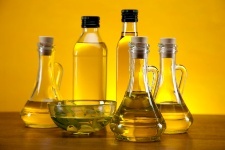 The polyphenol-rich olive oil also helped to lower LDL cholesterol. The researchers concluded that the consumption of a diet containing polyphenol-rich olive oil can decrease blood pressure and improve endothelial function in people with hypertension. Costa, A.F., et al., “Olive oil polyphenols decrease blood pressure and improve endothelial function in young women with mild hypertension,” Am J Hypertens. December 2012; 25(12): 1,299-304.